Updated with a better pic! Back in the middle of September when we dropped the accessory list that hinted toward future upcoming handsets a few stuck out because we had never before heard their codenames. 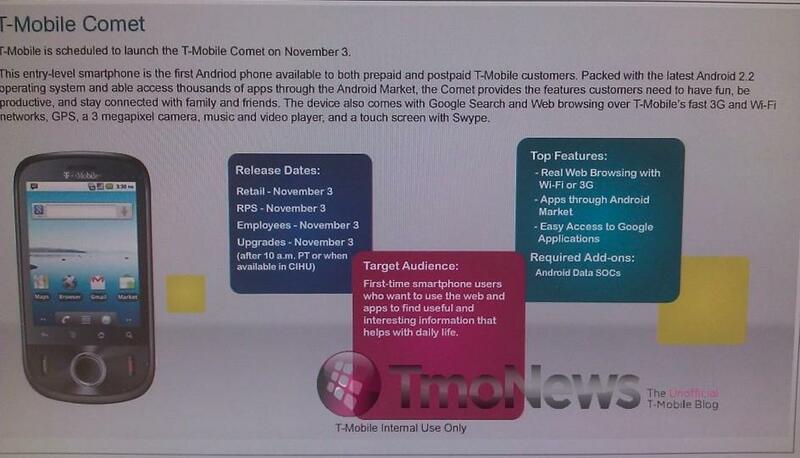 Well the “Comet” has officially been solved and will release as the Huawei Ideos to T-Mobile on November 3rd. Packing in a 3 megapixel camera, Swype keyboard and GPS (holy cow!) the Ideos looks to cater to the smartphone beginner as T-Mobile recognizes on the sheet above. No word on pricing but I wouldn’t be surprised if this comes in at under $100. Hit up the videos below for a better look at the future T-Mobile Comet! Not so bad for a beginner. Plus its inexpensive and has Vanilla Froyo. I downtown in line already to get one of these. I’ll sell my Nexus and live happily ever after. I think the line you should be in is not that one. going_home how much for the google nexus one that works will tmobile and not att? How is the condition of the phone? I hate the my touch 3g and what something a hell of a a lot better. I think you meant to say that is the ugliest android device on the market. No, that would be the Behold II. Behold 2 is discontinued (off the market) – this phone takes the cake in the T-Mobile lineup. Most heinous abomination goes to AT&T’s Motorola Backflip. That phone is the awkward teen of cell phones. Who has a keyboard on the back of their phone, really? This is Google’s response to Lack of stock Android phones. They will do it but in a entry level phone. Interesting…. What will Google’s response be to WP7? Is there really a need to create to usernames if you are going to use the same signature on each of them? What will be K. Ray’s response to Steve Jobless? Also worth noting that your avatar stays the same unless you change your email address. Hey 2.2 is coming this week for the original my touch 3G. Nice huh? Decent phone… Design is ok. Bigger screen, flash, better camera and I would have been bought. Looking forward to better design in future Huawei phones. All in all, good for starters. Stock Android makes this tempting in and of itself. If its less than $200 off contract, as the video speculated, I might pick it up just for that alone. Looks like T-Mobile will finally add Android to their prepaid lineup. Sounds like the Sidekick line is replaced with Android. My kids new phone! Perfect! Hopefully the higher model huaewei u8800 comes to tmobile. It’s hspa+ ready so it’ll have second gen snapdragon. That along with vanilla android will be awesome. 2.8inch screen is too small I mean come on at least have a minimum of 3.2inches of screen I mean this is android treat like so please. you can’t watch movies enjoyably on a 2.8 inch screen. Nor surf the web enjoyably. Open source will be the rise and down fall of Android. Sorry Steve but you could not be more wrong. N wifi is pretty nice. But who needs brand integrity when you can make bank selling low-quality phones to unsuspecting consumers? Will be great with the new 10 dollar android data plan…………. @ whyhellomichael…. what $10 android data plan? Great entry level Android phone. Has 2.2, Google for everything and the big thing I saw, SUPPORTS TETHERING AND HOTSPOT. THE G2 DID NOT COME WITH THAT BUT A FREE DEVICE FROM CHINA COMES WITH FROYO AND ALL IT’S GLORY. What gives T-Mobile??????? Why a free phone but not the company’s newest and supposed greatest doesn’t???????????????????????????????????????????????????????????????????????????? Based on how they have been pricing their phones lately TMO will probably set it’s “MSRP” at $350 or more. it looks like the behold 2 a bit, but with a better os version…. DAVID ! I feel this is a better introduction video of the new mytouch 4g ! Perhaps, but this is the Ideos post! I know my bad , didn’t think you would read my post if I put it in the old mytouch post! I know one thing, T-mobile has a gang of Androids at bat and on deck. But sadly there’s still no hope for a huge Android. This looks like a nice smartphone, however I would question the quality and would feel more comfortable with the Optimus as others have suggested. If these smartphones are priced right I would consider purchasing one. Does anyone know if TMobile would enforce a data plan if I bought the phone outright? Nice little phone. I would guess that this will be priced at $99.00 w/2yr contract. Great for the kiddies as a stocking stuffer. And the nice deals on the “Kids are free” promo should shore up Tmo’s sales for Q4. This phone isn’t for the tech savy nor the public at large, but geared towards those that are budget consious and those with kids screaming for a new phone for Christmas. If my lil man was older i would get this…my fiancee and I are just waiting for her sprint contract to run out. By dec.1st we are running towards a tmo store and choosing between the g2, mytouch 4g/hd, or an evo style of phone-if Tmobile get’s one. Sprint is nothing but garbage except there data plan and the 4g phones. after the last huawei nightmare (the t-mobile tap for those who don’t know) I’m completely shocked they are releasing another phone from this manufacturer. they must have gotten roped into some kind of contract with them. stay away from this thing, the tap was the worst phone t-mobile EVER sold.